This is the Executive Summary of our report No Brainer: The impact of chemicals on children’s brain development: a cause for concern and a need for action, launched in March 2017. The full text is available here. 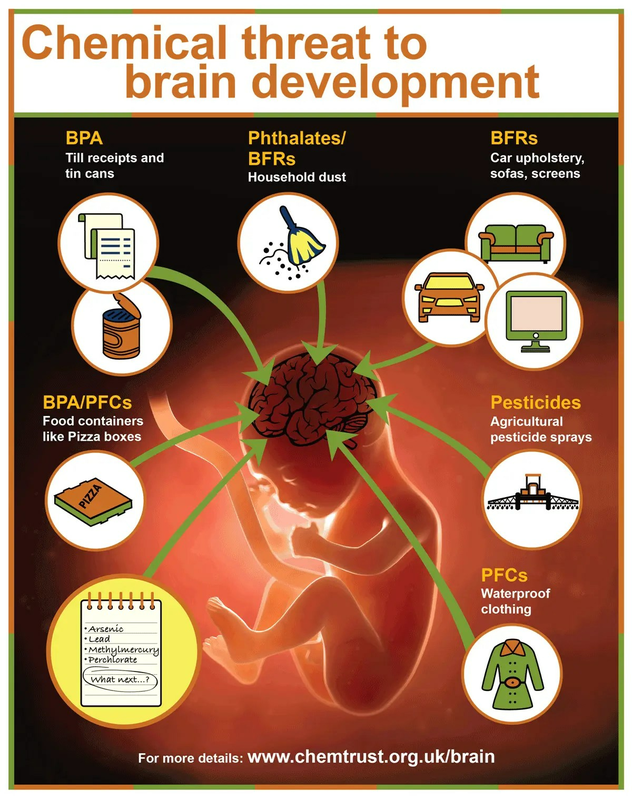 In June 2007 CHEM Trust wrote the briefing Chemicals Compromising Our Children , which highlighted growing concerns about the impacts of chemicals on brain development in children. Almost 10 years later, CHEM Trust has revisited the issue with this report, which includes contributions from two of the most eminent scientists in this area, Professor Barbara Demeneix (Laboratory of Evolution of Endocrine Regulations, CNRS, Paris) and Professor Philippe Grandjean (Department of Environmental Medicine, University of Southern Denmark, Denmark & Department of Environmental Health, Harvard T.H. Chan School of Public Health, Boston, USA), who also peer reviewed the report. Bisphenol A (BPA); a chemical that was used to make baby bottles, is currently being phased out of till receipts (in the EU), but is still used in the making of food can linings and many polycarbonate plastics. There are also concerns about closely related chemicals that are not restricted, including Bisphenol S.
Brominated Flame Retardants (BFRs); a group of chemicals added to furniture, electronics and building materials. The evidence for neurodevelopmental effects is strongest for the PBDE (polybrominated diphenyl ether) group of BFRs, which are already banned or nearly banned in the EU, though they are still in furniture in our homes, and in dust. However, other BFRs are now being found in dust and human blood serum, with concerns that these BFRs might have similar effects. Phthalates; a group of chemicals used as plasticisers in PVC and in other products.Some chemicals in this group are now banned in the EU, but many others are still in use. Per- and poly-fluorocarbons (PFCs); used as non-stick coatings or breathable coatings, are a large group of chemicals, a few of which are in the process of being restricted by the EU. There is evidence that some PFCs can disrupt the action of the thyroid hormone. PFCs are very persistent in the environment, and many of them can accumulate in our bodies – they are routinely found in blood. Perchlorate; a contaminant of food, related to the use of certain fertilisers and hypochlorite bleach, and which is known to disrupt the thyroid hormone system. The EU has the most sophisticated regulations in the world for controlling chemical use. Though full protection will only come from proper regulation of chemicals, the report also includes a chapter with tips for reducing your and your family’s exposures in daily life (available as a web page here).